"Psychologically sound tips for thriving, not just surviving, in college. From the summer before you start to finding your way after graduation following Lynn's and Jeremy's tips will make your college experience a spectacular success." "Clear, practical, accurate and comprehensive -- and one more key word. The key word is caring. These authors want you to succeed. They want your college life to be creative and rewarding. They want you to love it. Their caring comes through in every word. Listen." "Professors' Guide: The Secrets to College Success should be a summer must-read for every entering college freshman--the perfect high school graduation present! Jacobs and Hyman have amassed enough honest tidbits and helpful advice to help any student to more realize her/his potential through the college experience. Riddled with humor and witty in presentation, this lighthearted "easy read" could be the most helpful, honest resource for today's college student." "Professors' Guide: The Secrets of College Success needs to be required reading for anyone thinking of starting college, regardless of age. It is a great source of very practical advice that could mean the difference between success and failure." "The students who are most successful in college are those who are most prepared. Sure, it takes hard work, but it also helps to know what is expected, how to find needed support, and what common traps must be avoided. The college environment is different from that of high school or even what might be found in many jobs. Now, Professors' Guide: The Secrets of College Success reveals what students need to know, from the perspective of the professors who teach them. It pays to know the rules of the game before you play." "This volume provides a banquet of tips. Choose your favorites, from preparing to begin university to considering graduate school, from impressing your professors to using all the resources of the university, from getting good grades to managing your finances, and you are guaranteed to have the information you need to achieve your goals. Easy to read, easy to locate what you need, this volume will be helpful throughout your undergraduate years. I highly recommend it!" "It would be impossible not to learn something important from this book. The authors have gone to the source and harvested little known secrets." "Accessibly written and logically organized, there's something here for everyone. In an engaging and playful style, Jacobs and Hyman convey an essential truth that many students and their parents forget getting into college and graduating are only half the battle. What really matters is making the most of the opportunities that arise in between. This handy volume will help students focus on what it takes to be successful." 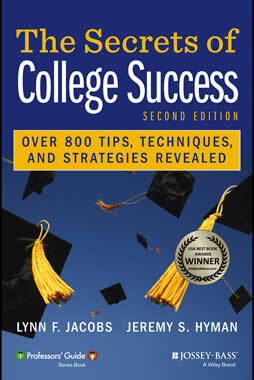 "The Secrets of College Success is an easy-to-read, highly informative book. In my experience, many students come in to Stanford unprepared for the realities of college life. With bite-sized and digestible tips, this book provides substantial advice applicable to any college student." "If I had my way, I'd give this book to every single college student, of any age, and make them read it. A book that moves from 'How to Turn a B into an A' to '10 Surefire Ways to Piss Off Your Professor,' is beyond just 'helpful.' It is 'the Missing Manual' for turning a merely 'okay' college experience into a delicious adventure. I laughed, I took notes, I loved every page. And I'm not even in college. If you are, don't even think about not buying this book. It will be the best thing you ever did for yourself." Richard Bolles, author of What Color Is Your Parachute? "Along with shower flip-flops and a very loud alarm clock, this book should be on every freshman's college packing list. The professors have outlined solutions for all the major fears that students face when they start college. Better yet, they've identified and solved the problems students should be thinking about, but probably are not." "What matters most is not where you go to college, but what you do when you get there. The book provides sound advice in a great format, on how to get the most from your college education, starting on Day 1 of your freshman year." "High schools focus on getting their seniors TO college but they rarely teach them how to get THROUGH college. Professors Jacobs and Hyman fill this gap with a series of high energy, digestible and practical tips that any student can master in one sitting. Professors' Guide: The Secrets of College Success should be required reading for every college-bound student so that they will be equipped with the 'under-the-hood' expertise they need to persist in higher education." Keith W Frome, chief academic officer, College Summit Inc.
"HI am going to college this fall, and I bought this book because I was getting extremely nervous about the work load of college. So I'm reading this book now, and a lot of the tips and humor are really easing my nervousness about college. It gives a slew of helpful tips and laughs on all sorts of subjects such as tips on emailing your professor, things to do before you go to college, and how to be a successful college student. But it also provides lots of humor such as the top ten signs you've been cutting too many classes. The best part about this book is that every piece of information is a part of a list. It makes it extremely easy to find what your looking for. You can read just the section you want, or all the way through (I opted for all the way through) And the book is not terribly long either. I notice a lot of books focus on the whole college experience, but if you are looking for a book specifically about the academic side of college life, then this book is the book for you!" Amanda (Arkansas, USA), Amazon.com reviewer 5/5 stars.